It’s no surprise, then, that “Billboard,” Zelker’s latest film, focuses on fictional Pennsylvania radio station WTYT 960, which protagonist Casey Lindeweiler inherits from his father. Finding the station on brink of financial collapse, Casey decides to host a billboard-sitting contest in which four people will live on a catwalk in front of a billboard for the chance of winning a mobile home. The film follows Casey as he finds himself faced with relentless attacks from his competition, the local authorities, the media, and Mother Nature, and struggles to keep his father’s legacy alive and stay independent. “Billboard” is more than just a movie. It’s what Zelker calls a “cine·exerience.” In conjunction with the film, which opens in the Lehigh Valley, New York, and Philadelphia on April 5, Zelker and his team created a virtual WTYT 960, which parallels the radio station in the movie and has been drawing an online listenership for years, and a 25-episode digital web series, “The Billboard Sitters,” which focuses on the four contestants. A regionally staged interactive play, loosely based on the web series, in which the audience and characters interact on social media, preceded the movie and series in 2013. “I try to build up the entire story world, and make it authentic,” Zelker says. “People who work in radio who have seen the movie say, ‘Oh, my gosh, you nailed that on the head.’ Having the radio station for years helped with that.” The various forms of media also enable audience members to dive deeper into the story world and add “a whole other level of promotion,” he notes. All told, the creation of the overall project involved more than 2,000 people, many of them local. The film, which stars John Robinson, Heather Matarazzo, Eric Roberts, Leo Fitzpatrick, Darlene Cates, and Oakes Fegley, was shot entirely in the Lehigh Valley. 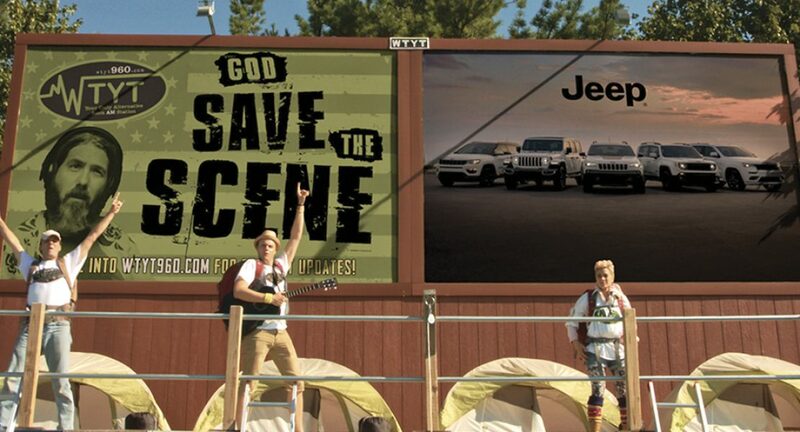 “We built a billboard in the sales lot of Rothrock on 15th Street. The radio station was the LCCC radio station. We filmed at various restaurants. You will recognize something. I definitely showed off the Lehigh Valley,” Zelker says. The movie, which will be shown locally at the Frank Banko Alehouse Cinemas at SteelStacks, will go into wider distribution later in the month. It will be available for digital download in July. To follow the cine·experience, visit billboardmovie.com, wtyt960.com, facebook.com/BillboardMovie, instagram.com/billboardmovie. Since then, he and iDream Machine have produced a number of feature films, including “InSearchOf,” “Body Mind Change,” “Loggerheads” and “Pandemic 1.0,” the first transmedia project featured at Sundance. “It’s a challenge to film here,” he admits. “It’s more expensive. You have to bring in the cast and crew, house them, provide transportation.” And while Pennsylvania offers a tax credit to entice filmmakers to the state, “You have to have money in the bank to get the credit,” he says, adding that the program is not meant for smaller companies, with less cash flow. Not all of Zelker’s films are set locally. “But I try to bring some aspect of the production to the Valley,” he says. The company also does commercial, real estate, wedding, arts events, and education projects, including Art Wars and Art Spark.